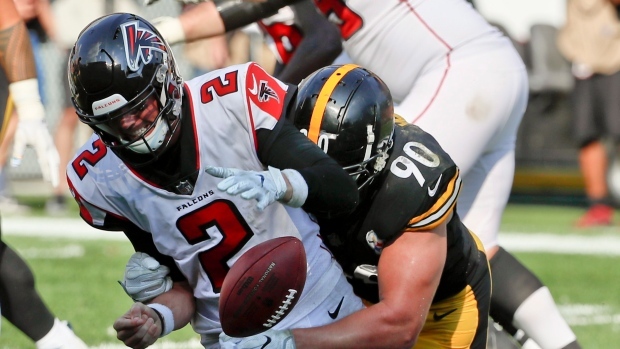 NEW YORK — Pittsburgh's T.J. Watt has been fined $20,054 by the NFL for his hit on Atlanta quarterback Matt Ryan, and the Steelers linebacker says he will appeal it. Houston's J.J. Watt, T.J.'s older brother, tweeted "That is insanity" and "$20,000 for this?!?!?" on Friday when news of the fine began to leak. Among other players fined $20,054 on Saturday for illegal hits on quarterbacks include: the Jets' Brandon Copeland, San Francisco's K'Waun Williams, Indianapolis' Najee Goode, Oakland's Bruce Irvin and Baltimore's Tony Jefferson. Oakland's Arden Key was docked $26,739 for unnecessary roughness in the Raiders' loss to the Los Angles Chargers. Several players were fined $10,026 by the league for various infractions, including: Kansas City's Kareem Hunt (unsportsmanlike conduct), Dee Ford (unsportsmanlike conduct) and Chris Jones (unnecessary roughness); Atlanta's Foyesade Oluokun (unnecessary roughness); Green Bay's Tony Brown (unsportsmanlike conduct); Cincinnati's Michael Johnson (unnecessary roughness); Miami's Martrell Spaith (unsportsmanlike conduct); and New Orleans' Michael Thomas (unsportsmanlike conduct).